Ligaments connect bone to bone. 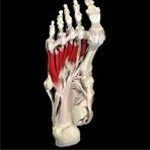 The long plantar ligament (Fig.1) is the longest ligament, and one of the strongest in the foot. It is attached to the surface of the calcaneus (heel) and the cuboid and to the bases 2nd, 3rd, and 4th metatarsals. 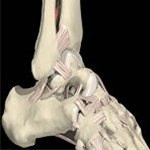 The long plantar ligament is an important factor in maintaining the lateral longitudinal arch of the foot. The calcaneus (heel) is the largest of the tarsal bones and forms the heel of the foot (Fig 2). The calcaneus articulates with the cuboid and talus. It is often fractured by direct vertical force, as when landing on the heel in a fall from a height. Shop our expert recommended braces, night splints, and supports for treating and alleviating the symptoms of Plantar Fasciitis. Read more..
Shop braces and supports that help alleviate symptoms of heel pain, spurs and plantar fasciitis. Read more..